Departing from those who define postmodernism in film merely as a visual style or set of narrative conventions, Anne Friedberg develops the first sustained account of the cinema's role in postmodern culture. She explores the ways in which nineteenth-century visual experiences—photography, urban strolling, panorama and diorama entertainments—anticipate contemporary pleasures provided by cinema, video, shopping malls, and emerging "virtual reality" technologies. Comparing the visual practices of shopping, tourism, and film-viewing, Friedberg identifies the experience of "virtual" mobility through time and space as a key determinant of postmodern cultural identity. Evaluating the theories of Jameson, Lyotard, Baudrillard, and others, she adds critical insights about the role of gender and gender mobility in the configurations of consumer culture. 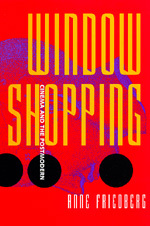 A strikingly original work, Window Shopping challenges many of the existing assumptions about what exactly postmodern is. This book marks the emergence of a compelling new voice in the study of contemporary culture. University of Southern California School of Cinematic Arts.